SPiKE protection safeguards the outputs. NATIONAL Semiconductor, represented by Arrow Electronics , has announced three new stereo audio amplifiers in its Overture line of products for home stereo systems. National's newest audio amplifiers feature quiet fade-in/fade-out mute mode circuitry that gradually brings the sound up or down. These "easy on the ears" transitions enhance the listening experience in compact stereos, high-definition televisions (HDTVs), 5.1 surround sound systems and other consumer electronic equipment. National's LM4780 is a stereo audio amplifier capable of delivering 60W per channel of continuous average output power. The LM4781 is a three channel audio amplifier capable of delivering 35W per channel of continuous average output power into an 8 Ohm load. The LM4782 is a three channel audio channel capable of delivering 25W per channel of continuous average output power into an 8 Ohm load, all with less than 0.5% total harmonic distortion plus noise (THD+N) from 20Hz-20kHz. 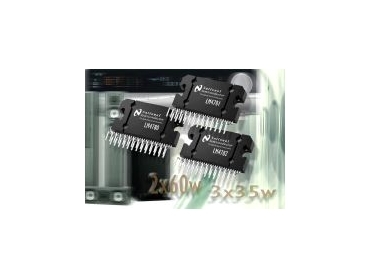 The amplifiers are fully protected by National's self-peak instantaneous temperature (°K) SPiKE protection circuitry. SpiKE circuitry provides a dynamically optimised safe operating area. SPiKE protection safeguards the outputs against overvoltage, undervoltage, overloads, shorts to the supply or ground, thermal runaway and instantaneous temperature peaks. The amplifiers can easily be configured for bridge or parallel operation for higher power and bi-amp solutions. All three feature independent, smooth fade-in/out mute. In addition, the LM4782 has a power-conserving stand-by mode. The mute and stand-by modes can be controlled by external logic signals.